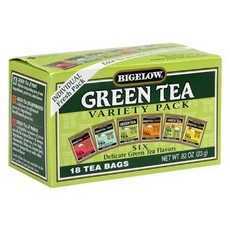 Enjoy Bigelow Green Tea Assorted (6x16 EA). This tea assortment contains 3 tea bags each of these 6 blends: Green Tea, Green Tea with Peach, Green Tea with Lemon, Green Tea with Mint, Green Tea with Pomegranate, and Green Tea Decaffeinated. (Note: description is informational only. Please read product label prior to use and consult your health professional with any question prior to use.